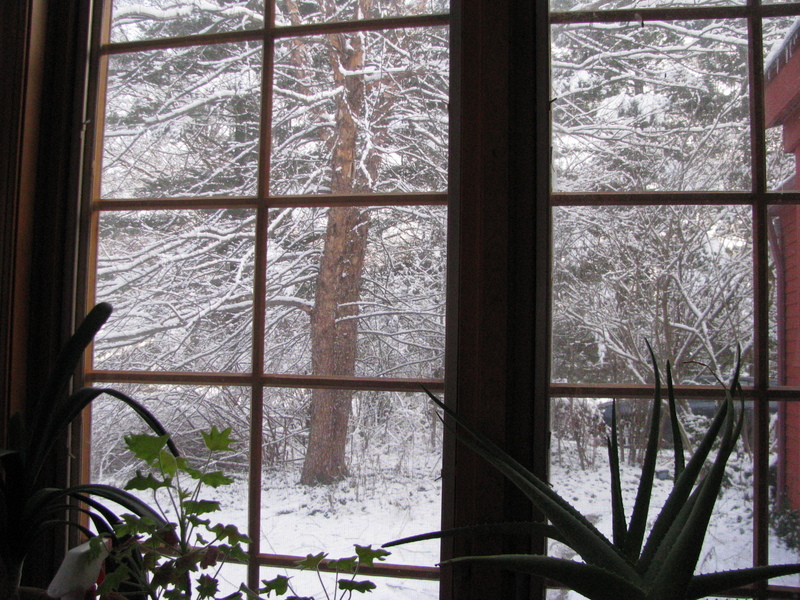 « Christmas was Last Saturday morning……. There’s No Place Like Home……….There’s No Place Like Home……. Late last Wednesday I returned home after my stay in the Edwin Shaw Rehab Hospital which was after my days in Summa Western Reserve Hospital for double knee replacement surgery. Truly, there is no place like home, although the people in both hospitals were outstandingly kind, encouraging and took wonderful care of me and all their patients. Even the housekeeping people were very friendly and we got to know one another very well. But I’m finding that I am sleeping better here at home, which is no surprise! 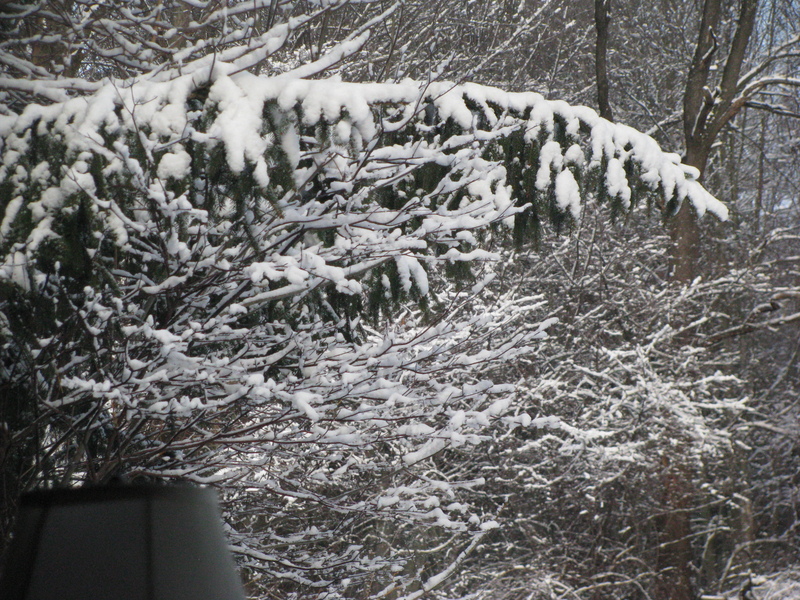 It was a winter wonderland when I came home, with lovely snow decorating the branches of the trees and shrubs in my garden and back yard. But next day, already melted away. 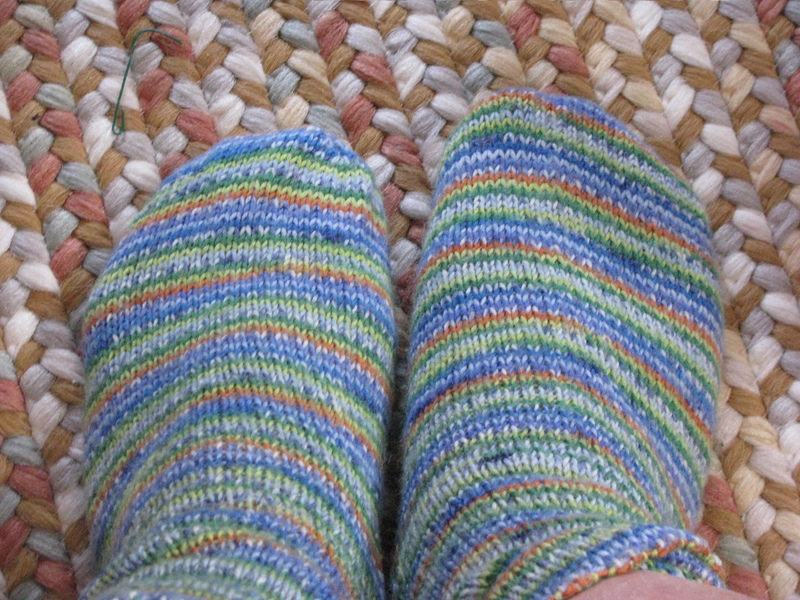 I have two pictures of the snow and a third of my feet in the delightful handknit socks sent to me from Norwegian blogger Britt-Arnhild Wigum Lindland whose sock give-away I won. I do think the socks helped my recovery, which is not at all over yet (full recovery takes a good year and it’s more than two months for recovery from double knee surgery.Her blog Britt-Arnhild’s House in the Woods is a delight every morning. My heart is full of gratitude to everyone who prayed for me, and sent messages of encouragement and kind wishes. It certainly all helps. And my kids were heroes. I think I didn’t quite plan exactly right for the timing, didn’t give enough thought to the convergence of my surgery, Christmas holidays, and Alice and Andy’s huge room remodeling project for Andy. They had a lot to do! But they did and are doing it all. Yesterday Andy drove me to the office of the surgeon where we were able to see x-rays of my new “bionic Nana” knees. I am so glad that I didn’t put this off any longer. The doctor said the knees were worse when he actually saw them than he had thought they would be from the initial x-ray. Not only were they bone on bone, but in the left knee bone was being worn away. They put an extra titanium screw in to reinforce the implant. The doctor told me that in about two weeks I’ll be feeling much better and my stamina will improve more. I know there is a long way to go, and a lot of work, but I feel things are going better than I had dared hope, already. I am looking back over 2011 on this last day, and looking forward to 2012, a year in which I hope to be able to do many things I haven’t done for far too long, things that involve being able to walk around on my own two legs. How lucky we are that things like this surgery are possible now! So happy to hear that you are home again. One brave lady. Britt-Arnhild’s socks do look wonderful on you!!!! Follow directions closely and you will be up and dancing soon. A very happy and healthy New Year for you. So good to know that you are home again, Kristi. Let the healing continue right there in the comfort of home. You are not the only one who chose an “interesting” time for surgery as Mr. Cottage Days and Journeys opted to have a hip replacement right through the holidays and is just now home as well after ten days in rehab. Are you going to have some home help or are you basically on your own and good to go? I can’t imagine dealing with the pain you must have been experiencing so perhaps the time thing over Christmas wasn’t nearly as important as getting on with things. All the best…visit anytime and nudge me…I love to visit and chat. You do have a lot to look forward to this next year. There are so many things you’ve had to cut back. Your family must be as glad as you are that knees are new. Great news and lovely pictures. I have been praying for you and I am SO glad you are home again. I’m glad to hear that everything went well. oh yes, your own bed in your own home is the best place, no matter how kind the hospital staff is. Not to mention how nice it is to be surrounded by your own things – especially your own books! I’ll keep holding you in the light. Sincere and heartfelt thanks for all the prayers and good wishes! I’ve conjured in my mind a picture of you running in slow-mo with the Bionic Woman theme playing in the background 🙂 Thank you so much for your prayers and words of encouragement, Kristi. I’m feeling much better. And to answer your question, yes, I do listed to audio books. I’ll continue praying for you. May this be a joyful year for you and yours. Hugs. I’m glad to have you back and in such great spirits. Have you been drinking? Just kidding! Congrats on those shiny new knees of yours. I got nothing for Christmas! Lucky you! Loving those socks too. Homemade presents are the best. Yes, nothing like home, is there? And now you have a lot to look forward to, and health-wise, 2012 will be much better than 2011! My mum knits such socks, too. I have a small basket full of them and wear them around the house instead of slippers, and even in bed when I have cold feet. Thanks for promoting my socks Kristi 🙂 I am glad you won them.